Terry Turrell worked for years as a pharmacist back in Ashland, Oregon. It was a stressful job; she’s happy to be retired. But this is no laidback retirement. She keeps very busy… This time it’s with work she finds fulfilling. Terry and her husband Jon live in the village of Sayulita, on Mexico’s Pacific Coast, about 45 minutes north of the resort destination Puerto Vallarta. And from her home office Terry has taken up a new career as a writer. She considers it a rewarding business that provides a bit of income, but more importantly it helps people. She’s the author of three e-books about retirement and living in Mexico. She also maintains two frequently updated blogs that highlight their expat life and the couple’s adventures in their community. The blogs are also a way to promote her books. 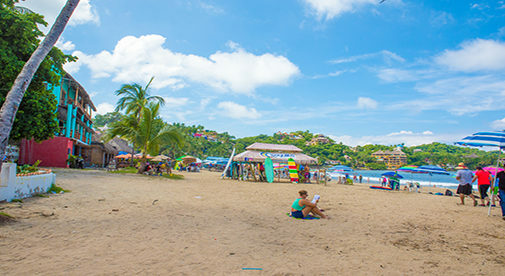 Sayulita is a famous surf spot, popular with those interested in yoga and natural health as well. It’s set on a bay, with the beach lined with small hotels and restaurants. The jungle-covered hills above are spotted with luxury villas. “We needed to live somewhere you can stay active and exercise. This town has so much you can do. Surfing, yoga classes. A big part of why we like this town is that you can walk everywhere,” says Jon, who notes the couple doesn’t have a car. They also bike, boogie board when the waves are good, and stand-up paddle board when the water is calm. Some days, they just enjoy sitting at the beach. It’s an active lifestyle in a beautiful tropical setting. When they get home from a day out and about, Jon reads and Terry starts writing, either a new e-book or for her blog. She’s found that her new slower-paced life keeps her productive. In fact, she also manages to teach Zumba, an activity she took up when she retired nearly five years ago. “I teach at El Club, a fitness center with a hardwood floor, mirrors, and a great sound system—perfect for Zumba classes. The class is half expats, half locals and tourists. It’s a great way to keep in shape. And it’s a social thing too,” says Terry, who charges 50 pesos ($2.70) per person per class or 200 pesos ($10.75) for five classes. Like her e-books, teaching classes brings in some extra income. But mostly she enjoys helping her students stay active. In retirement, she’s picking and choosing the work she does, and living in Mexico with a cost of living that is about half what it was in the States makes this easy. Sayulita offers other benefits too, say the couple, including great restaurants (they enjoy happy hour and dinner with salsa dancing at Don Pedro’s), the availability of fresh produce at local markets, and the ability to get by with limited Spanish, although they are taking Spanish classes. The climate is just about perfect for them. “We also like living close enough to Puerto Vallarta that we can drive our motorhome into the city and stay at the trailer park for a long weekend of listening to live music and dining at fine restaurants on the beach. We thoroughly enjoyed the Rhythms of the Night boat trip, dinner, and show there recently,” says Terry.